In which the proprietor dumps a bunch of coffee-related stuff into a single post. Enjoy. 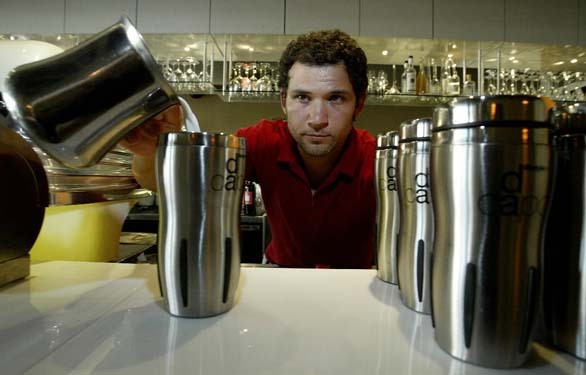 Cuppa Joe to Go, Hold the Cup — In Edmonton, the DaCapo Caffe won’t give you a paper cup for your takeout coffee. Co-owner Antonio Bilotta, 31, says he’s tired of the waste. Circle the Wagons! — As Starbucks sets its sights on rapidly expanding its presence in St. Louis, area coffee shop owners are banding together to fight back. “We’re the neighbors” is how Craig Schubert, owner of the 1st Cup kiosk close to Chrysler’s plants in Fenton, summarizes the sales pitch. It’s based on the idea that “St. Louisans love to support the home team,” said Ben Murphy, managing partner at Applegate’s Deli & Market. Bloggle’s advice to the home team: it’s all about the coffee. Cuppa Joe, Hold the Carbon? — Starbucks has been calculating its carbon footprint, with an eye toward going on something of a diet. In its shop in downtown San Mateo, Calif., for instance, baristas serve up about 40,000 cups of coffee drinks every month. Just based on utility bills alone, that means Starbucks is serving up about 4,900 pounds of carbon with its drinks–or about two ounces per cup. I wonder… does that include a paper cup?